If you are following recent interior design trends, you know that having a great vintage rug is a must! While adding color and pattern to the overall design, these floor coverings also introduce character and classic appeal. For design lovers, part of the fun in finding the right area rug is heading to the local flea market and score some killer finds! The flea can be overwhelming and knowing how to spot rug gems is a trained skill. Lucky for us, our very own Decorilla online interior designer, Tabitha Mund, has expertise in this area. The following are her tips and tricks that will help you become your very own rug pro. One of the quickest ways to identify a quality vintage rug is to flip over the corner and check out the back. If you see the same pattern on both sides of the rug, you are headed in the right direction. DO: If you look past the white weft yarns (yarns that run across the body of the rug) in the rug above, you can see the same floral pattern as well as the major and minor rug borders that appear on the rug face. On hand-knotted rugs, the back will be slightly rough and image will be made up of little square pixels (think 1980s computer graphics) and the face will be formed from the soft tips of fibers. 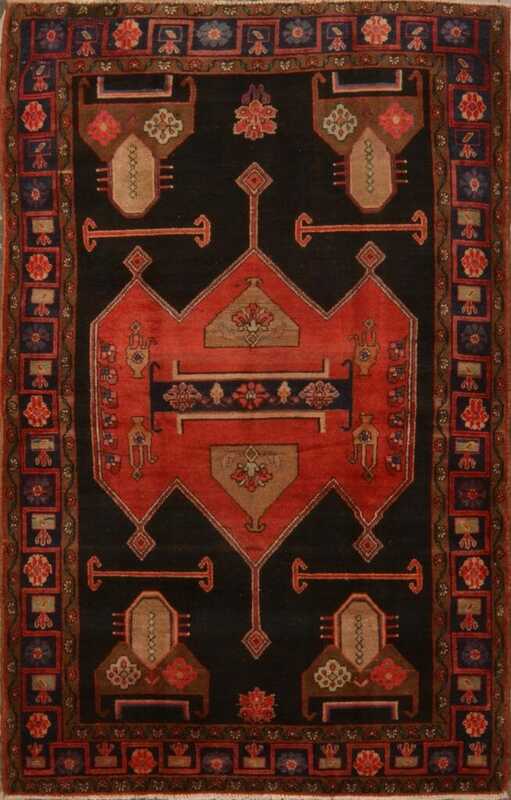 With a flat woven rug, a dhurries or a kilims, the face and back could be indistinguishable. These rugs are actually reversible. DON’T: Now that you know what you are looking for in a rug back, it’s good to have an idea of what to avoid. Buying a hand tufted rug is not recommended, especially not a second hand tufted rug like the one below. Here the backing has been glued in place. Tufted rugs are made using a much faster process that produces a rug that lasts a fraction of the time of a hand knotted piece. These rugs hold dirt, are difficult to clean and do not represent a good value. 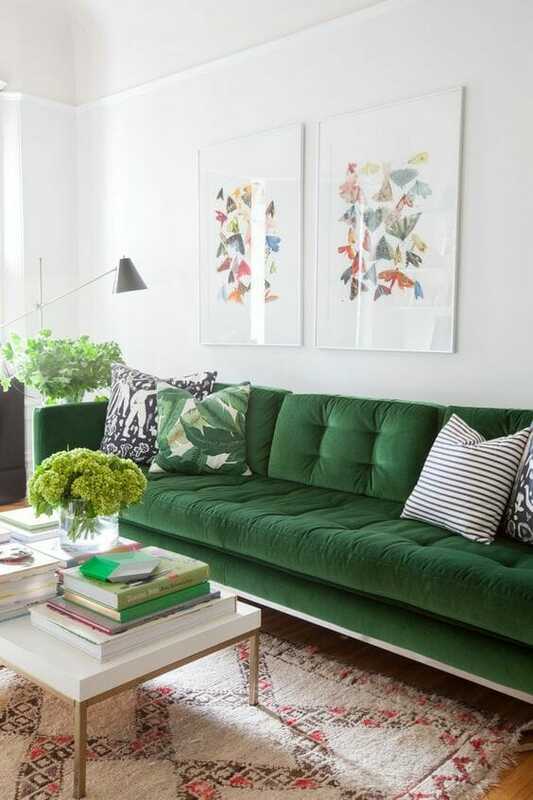 So if you’ve find a rug you love and you’re reasonably sure it’s hand knotted or a flatweave (kilim or dhurrie), you’ll want to look the rug over for some potentially fatal issues. A little wear and tear is part of the allure of vintage pieces. A quality rug is designed to live a long life. Vintage rugs have history. The little imperfections collected over time are like little clues to a past life. And as charming as these little mysteries can be, you want to avoid any damage that will affect your future with your new find. In a handmade rug, the fringe is not simply decorative. The fringe runs from end to end through the entire body of the rug forming the base for weaving. You can think of it as the skeleton of the rug body. The fringe in this hand knotted rug is fine. Short fringe is fine on a vintage rug. 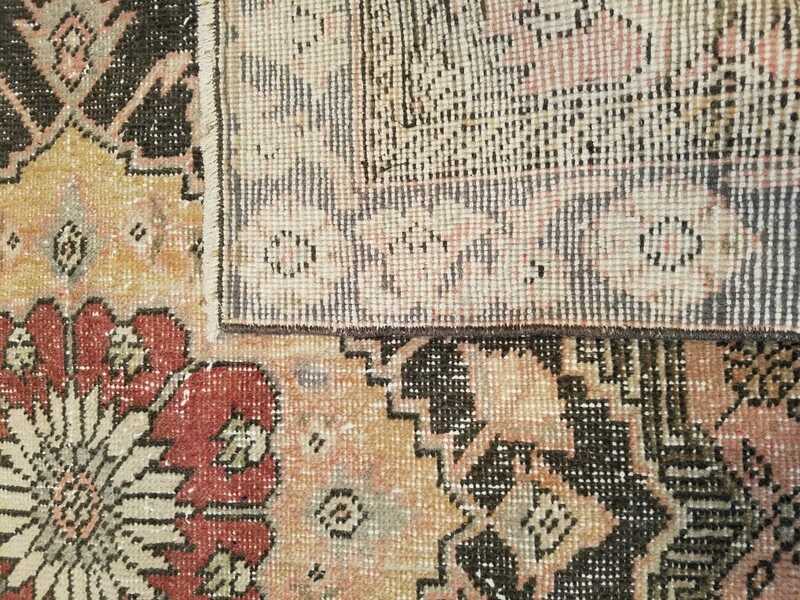 In vintage rugs, fringe can be short due to previous wear. It can even be, uneven, so worn down in space places and longer in other, and it’s still fine. If the fringe has been worn away into the body of the rug, it’s time to worry. In this case, the structure of the whole piece is in danger of coming apart. 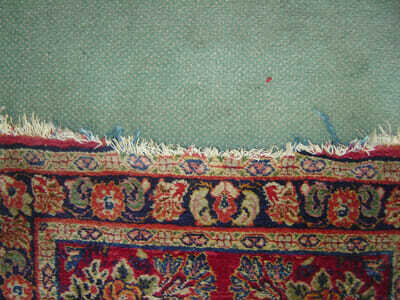 Unlike holes in jeans, a hole or rip in your rug can create some big problems. Because the rug is walked on, the fibers surrounding the opening will start to slip off, and continually eat into the body of the rug. 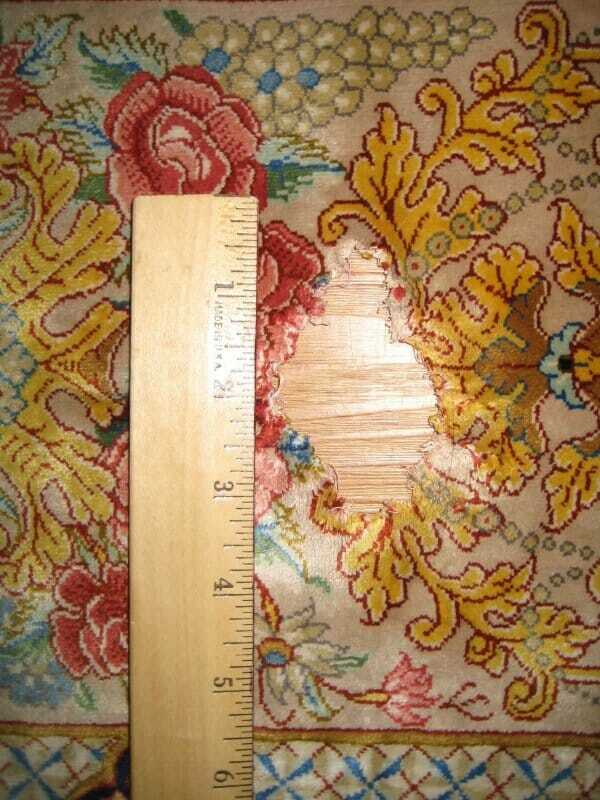 The cost to repair a hole in a hand-knotted rug can be pretty extreme. 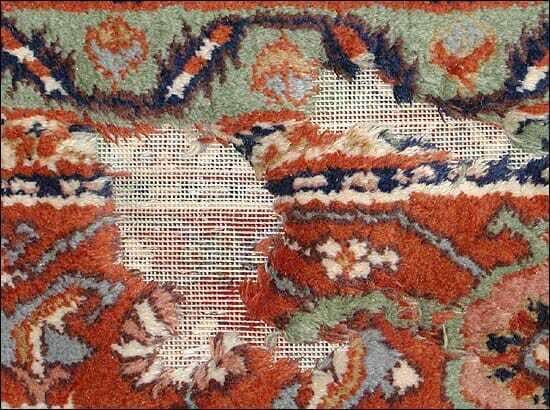 Keep in mind, the weave of kilims creates little openings that might look like holes, but there should not be any frayed loose fibers in these area. The opening occurs when the weaver is changing colors and it is not a flaw. It will appear as a perfect, clean edge opening, between two different colors. Moth damage looks like holes that don’t go all the way through the rug. 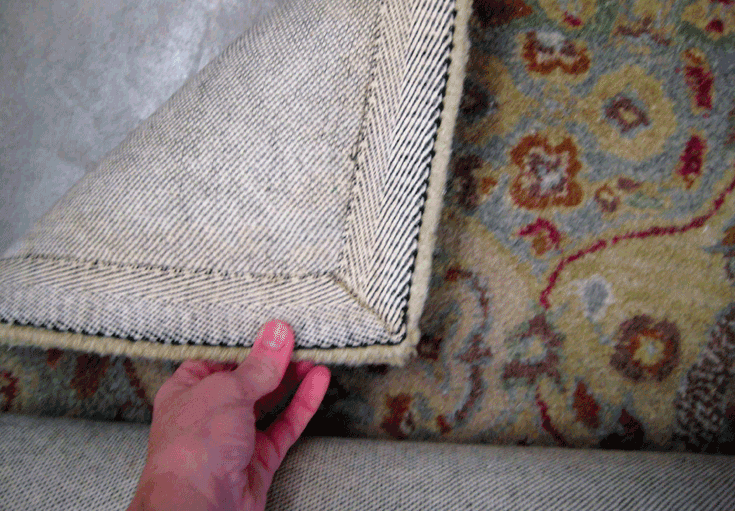 So it will be areas in the rug pile where the fiber has been consumed by larva down to the warp and weft of the rug. If you fall in love with a moth-eaten rug, plan to get it cleaned and treated by your local oriental rug cleaner to avoid an infestation. In an older rug, you might notice a few years where the wool fiber has been worn away down to the warp and weft threads. This is fine. TIP 3: Love it or leave it! If you absolutely fall in vintage rug love with a damaged piece, use the info above to ask for a better price and know that you might need to invest in some restorative services. The most critical thing to keep in mind when shopping for a quality carpet: you should love it! Find a quality piece that makes your heart sing and you can enjoy it for years to come. 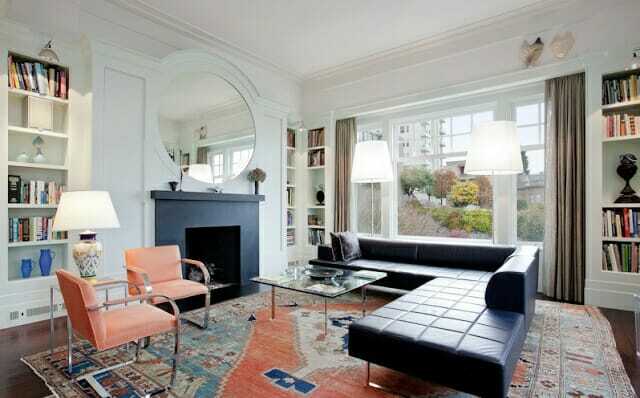 Wanting professional help in picking the right vintage rug for your space? Start a Decorilla project today and work with our rug savvy designers to find the one for you! 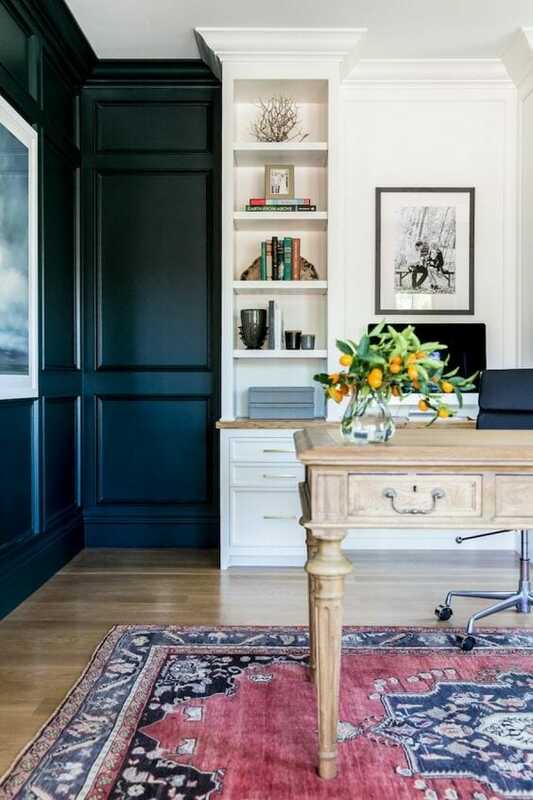 Written by Decorilla designer and owner of Swoon Rugs, Tabitha M.